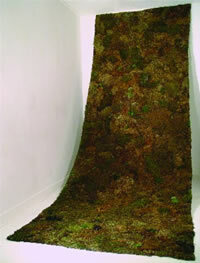 Living mosses, clay, engobe, video projection. Originally created for the Canadian Clay and Glass Gallery. Artist, curator, teacher, presenter, and most recently, art dealer, Christian Bernard Singer was born in 1962 in Paris and raised in New York City where he began as a company dancer with Laura Foreman's Composers and Choreographers Theater. He is a graduate of the Ontario College of Art and Design and received his MFA from the New York State College of Ceramics at Alfred University. He teaches sculpture at the Ontario College of Art and Design and the Toronto School of Art. As well, Singer has managed grant application programs for both The Canada Council and the Ministry of Culture and Communications (Ontario), was Director of CAFKA 2005, Curator and Associate Director of Leskiw Fine Art, and has served as board member to several arts organizations. He is director of Rouge Concept Gallery and Rouge Contemporary Projects. In his own practice, Singer incorporates living plant life, glass, clay, bronze, found objects, and video into installation-environments and land art works that turn on notions of place, memory and time passing. 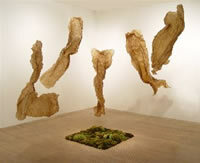 Recent exhibitions and projects include: Aligning with Beauty at the Varley Art Gallery; Cabinets of Curiosities (2008) and Tessellated Anamnesis: Patterns for Unforgetting (2005), Canadian Clay and Glass Gallery (Waterloo); Revivified, Headbones Gallery (Toronto); Mobile Structures: Dialogues between Ceramics and Architecture in Canadian Art, MacKenzie Art Gallery (Regina) and the Surrey Art Gallery (B.C. ); The Edward Day Gallery's Kiwi Sculpture Garden Project (Perth); The Shore/Lines Project: Responding to Place at the MacLaren Art Centre (Barrie); and Second Nature at the Fish Tank Gallery (New York City). His work is represented in Toronto by Headbones Gallery.